Donate to FOCB on April 24! The mission of the Florida Outreach Center for the Blind is to develop and administer programs that will integrate blind and visually-impaired persons into the social, economic, and spiritual lives of their community. 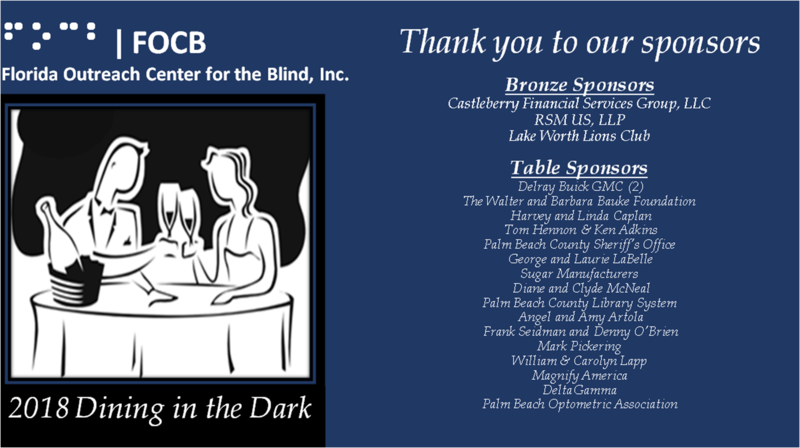 The Florida Outreach Center for the Blind (FOCB) is a not-for-profit agency formed for the express purpose of providing services to people in Palm Beach county and surrounding areas that are blind or visually impaired. It was founded in 2003 by Carolyn Lapp. Ms. Lapp established the FOCB with a mission to address the needs of the estimated 33,406 blind and visually impaired individuals in the County. FOCB believes if you give blind and visually impaired people the tools and services they need, they will develop a positive attitude toward their blindness, cope with their visual challenge, and contribute to their community. Therefore, FOCB is unique among local organizations serving blind and low-vision persons, because the CEO, many of the staff, and at least half of the board members themselves are blind or visually impaired. The FOCB takes great pride in creating jobs for the visually impaired by serving the visually impaired. In turn, this creates an integrated community for the blind and their families. Florida Outreach Center for the Blind Introduces the Hearing and Vision Advisory Support Group! The purpose of the Advisory-Support Group is for FOCB participants who are classified with hearing and vision loss to have the opportunity to express his/her unique experiences with dual sensory impairment and to have a place to connect with each other as a source of support. The Advisory-Support group allows members to be able to express what his/her unique needs are as a person who is experiencing both hearing and vision loss. Also, they can discuss what works best for them when communicating and interacting with others. One of the primary purposes of this group is to advise FOCB by making recommendations for continuously improving methods for working with individuals who are hearing and vision impaired. Another is to stay up to date with new technologies that would benefit this group. Finally, we hope to provide supportive community resources. This group will strive to reach out to the Deaf Blind community within Palm Beach and surrounding counties by producing publications and hosting seminars and events. The meetings are held from noon to 1:30 P.M. on the third Friday of every month at the Florida Outreach Center for the Blind. Please contact the Center at 561-642-0005 if you are or know of someone who may benefit from this group. Provide demonstrations of low vision adaptive aids and appliances. Provide information for other community agencies and make referrals. Provide information and assistance for the blind concerning their civil rights. Provide blind awareness and education for the community. Provide opportunities for socialization, recreation and hobbies through a variety of special interest groups. All participants will be supported in creating personal goals for living independently. Donate to FOCB by clicking the Great Give Logo! To enroll in these programs, call (561) 642-0005.